AP LAND Development Sdn Bhd is confident of selling all its luxury bungalows situated in Kampung Paya Jaras, Selangor, as soon as possible. 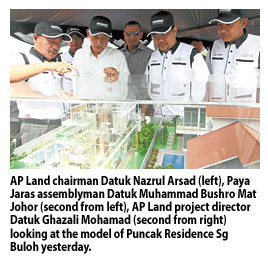 Its chairman Datuk Nazrul Arsad said the 16 unit bungalows, called Puncak Residence Sg Buloh, situated on a hill and will be completed within the next 24 months. "The gross development value for this project is RM20 million," he told reporters at the groundbreaking ceremony held at the site yesterday. He said currently only five to six units are still available for sale, while the rest have been already booked. "We managed to sell all of the units because people like the concept of these bungalows which has its own swimming pool. Our concept is also unique because its luxury living in a kampung," added Nazrul. Each unit, he said, was sold between RM1.5 million and RM2 million. "It's a good deal because we are not that far from Kota Damansara (a prime area which houses Ikea)," he added. He said the bungalow units were two storeys each, six bedrooms and has an individual built up area of 3279.67 sq m from 5344 sq foot land area. AP Land, which has been in business for the last 12 years, will also be building the Project Rumah Rakyat in Kuantan, Pahang, worth RM300 million and Kooperasi Perumahan Angkatan Tentera in Perak worth RM800 million this year. "Our company will remain private entity. There is no plan to list it on the local bourse. At present, our order book stands at RM1.3 billion and last year, our net profit stood at RM200 million," he said. He said the company will concentrate on building affordable homes and work on getting more joint ventures with the government.